Home » Articles » Things To Do » GAS Feed & Seed Festival is Back! 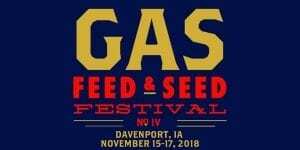 Hey Quad Cities, are you ready for the GAS Feed & Seed Festival? GAS Fest will pull together 20+ of the most exciting, innovative and hotly tipped artists and comedians that the country has to offer. This 3-day festival is hosted by Sean Moeller of Moeller Nights and takes place this Thursday Nov 15, Friday Nov 16 and Saturday Nov 17 at both the Raccoon Motel (304 E 3rd St. Davenport) and The Stardust (218 Iowa St. Davenport). Tickets for Thursday shows are $20, Friday tickets (good for both venues) are $30, Saturday tickets (good for both venues) are $40, Weekend Pass (shows on Friday and Saturday at both venues) is $40, 3-Day Ticket is $50 and a Golden Ticket is $70. Tickets can be purchased now at https://www.eventbrite.com/e/gas-feed-seed-festival-tickets-48250759320. For more information or updates, visit https://www.moellernights.com/ or https://www.facebook.com/events/689194151431788. Don’t miss this amazing 3-day festival filled with the best music around!